A unique park in central Vietnam has officially begun operation and stunned visitors with its landscape decorated with waste materials. 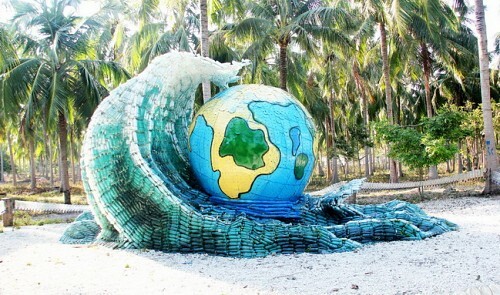 Sitting on an area of over one hectare at a beach in the coastal city of Nha Trang’s Hon Lao Island, the park features artwork made of waste materials including beer cans, plastic bags, vehicle tires, and bottles. “We encourage our employees to re-use waste materials and turn them into useful products as discarded stuff is not always useless,” said Le Dung Lam, general director of Long Phu Tourist Joint Stock Company, which owns Hon Lao Island. Besides playing with domesticated monkeys, visitors can visit a landmark that proves Vietnam’s sovereignty over the Hoang Sa (Paracel) archipelago and ponder animal statues including snakes, horses, and white storks, all made of waste. One of the most unique decorations is a 60 meter square house made of 12,000 used glass bottles. The roof is constructed out of milk bottles, the walls are built with shells, and the furniture within is composed of old tires. The house only cost around VND80 million (US$4,000) to build rather than the VND200 million ($10,000) it costs to construct one from conventional materials. Long Phu plans to build a wider 5,000 meter square eco-friendly landscape which will exhibit artwork made of waste materials and to set up a workshop where visitors can create their own art. Both constructions are expected to be completed in late 2014.